Which company you choose to build your swimming pool could be one of the most critical choices you make for many years. Unless you bought a new construction house, you didn't get to choose your home builder, and most likely didn't think to ask much about the construction company before you signed the papers. With a swimming pool, you get a fresh start, an opportunity to look deeper into the reputation, quality, portfolio, and warranty offers of your next construction company. The first thing you should familiar yourself with is the cost of labor in your area. I've broken down construction labor costs into six categories: very low, low, average, high, and very high. Here's how they play out state-by-state. Why is this important? Because below-market labor costs usually means unskilled hands, undocumented workers, or worst - fly by night builders. Since there is no way to verify whether a pool company actually build the pools they are showcasing in their gallery, we recommend you browse but don't place too much emphasis on a builder's portfolio. Can you save by building a pool in "low season"? First of all this depends on your state. Florida for example does not have a low season and many parts of California do not either. CA has agencies heavily engaged in promoting pool ownership year around, like the CA Pool & Spa Association. Texas is a different story. 100+ degree summers and below freezing winters makes Dallas, Houston and Austin volatile markets for pool companies. In such places, your best course would be to plan a pool build in the start of winter, when business is relaxed and pool companies are looking to shift resources from weekly pool cleanings into pool construction. There are many Dallas and Houston pool builders that have this need to shift company focus because warmer months require a strong dedication to keeping pools clean and equipment functioning. As with any project, take no less than 4 bids, and not more than 8, from different companies to compare and keep the negotiations competitive. We say no more than 8 because not many people can juggle that many variables without growing frustrated and capitulating by haphazardly choosing something. 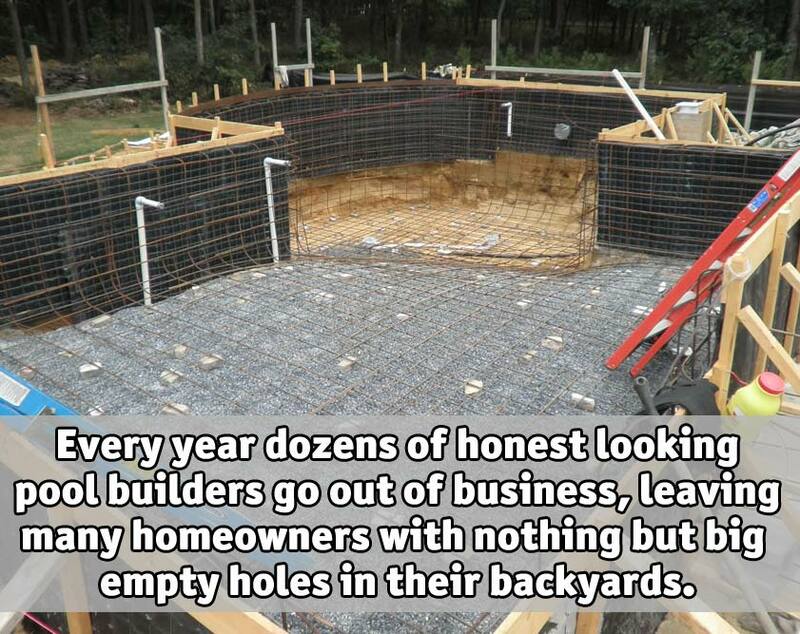 How long have you been building pools? Have you ever declared bankruptcy or left pools unfinished? Who are your pool suppliers? Do you handle all parts of the pool build including the electrical connections? Will my checks be written to a personal account or business account? Will my pool be built by contractors or employees of your company? What warranty will I receive on the pool structure, equipment, deck, coping, etc? How will you minimize damage to my lawn and landscaping?